Our Sunday School and Episcopal Youth Fellowship (EYF) are planning a very festive weekend to celebrate Mardi Gras and ALL ARE WELCOME! On Saturday, February 10, after the 5pm service, EYF and friends will gather in Bentley Hall to decorate for Mardi Gras while enjoying Popeye's chicken, gumbo, etc. and listening to Zydeco and Cajun music. 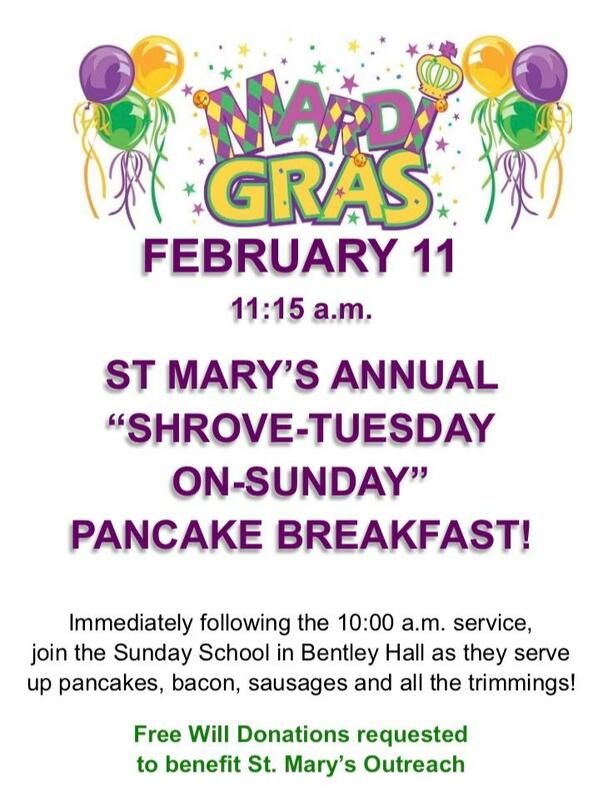 On Sunday, after the 10am service, the Sunday School will serve up flapjacks and all the trimmings to celebrate Mardi Gras with our whole parish family. Please bring warm clothing for Helping Hands (e.g. thick mens socks, hats, scarves, gloves). Thank you to everyone who helped make our annual Mardi Gras celebration so much fun -- what a great way to close out the season of Epiphany! Thank you especially to Greg and Patte Stevens, our chefs, who prepared a delicious breakfast; the EYF and Sunday School who helped decorate and serve; and everyone who gave so generously to our outreach appeal (for helping people in need locally as well as in Africa). Please visit our Facebook page for more photos of the event and to follow all happenings at St. Mary's.